Hypodontia-missing teeth, baby teeth, spaces, implants, orthodontics, restorative dentistry : What is a resin bonded bridge ? of the bridge supporting a porcelain tooth in position. A 'resin bonded bridge' (also known as adhesive bridge, maryland bridge, resin bridge, sticky bridge, resin retained bridge) is a type of bridge that is fixed to a neighbouring tooth. 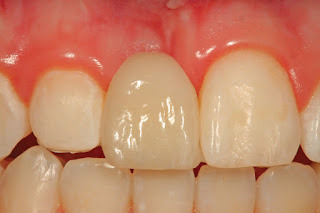 These bridges do not damage the teeth they are connected to and use a specialised type of dental glue that engages natural microscopic holes in the tooth's surface. Resin bridges do not involve the need for anaesthetic, needles, drilling of the tooth, or any surgery. Another advantage is that modern provision of this type of bridge has excellent research to show they can last a very long time without complications, problems or the need for replacement. Click here for new research on resin bridges. A resin bonded bridge replacing the right hand central tooth. In the growing child or adolescent this is a favourable method to fill a tooth space. In adults they are also very successful and efficient resulting in a high amount of patient satisfaction. 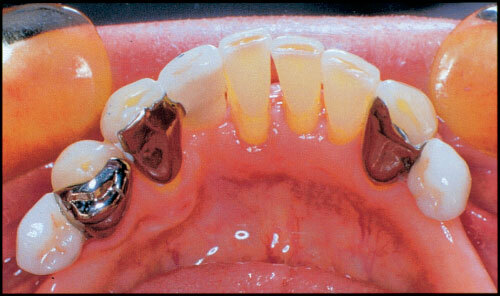 Multiple teeth can be replaced using resin bonded bridges.